Getting down to our creative work can be challenging, right? There are distractions, inertia, resistance, anxiety, doubts... and sometimes it feels like they are all conspiring together to make it nearly impossible to cross the threshold into the spaces where our creating happens. Sometimes that means we literally can't seem to make ourselves enter the doorway of our studio or open the laptop or file that is our writing space. Other times it means that we get in there, but just "can't get into it." By which we mean we struggle to cross the threshold into the altered state of consciousness they call "flow" - the state of deeper focus that arises through intimate connection to an unfolding creative challenge. But we can't just slam ourselves into this altered state of consciousness, any more than we can slam ourselves instantly into sleep or meditation or sexual arousal or attunement to nature. Getting from one state to another requires a transition, a process through which we move from one way of being or thinking or feeling to another. It's really all about the curtains - how did I miss that? 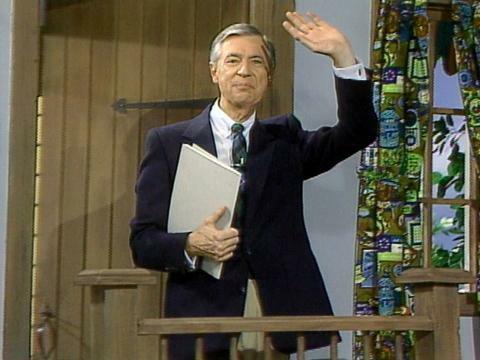 As I've been pondering the theme of "crossing the threshold" this month, I started thinking about one of the premiere threshold-crossers of all times - Mr. Fred Rogers. He came through the doorway between his TV neighborhood and his TV house something like 900 times in the 30+ years of his show, and each time in the same carefully-choreographed way. I started to wonder whether his ritual entrance across the threshold from the busy-town social world of the "neighborhood" into the interior, intimate, world of the home could actually offer guidance for us creators who are trying to learn to more gracefully transition into our creative spaces. Full disclosure: I have a personal relationship with Fred Rogers that I should probably reveal here. He and I met sometime in the mid-eighties when the Mr. Rogers' Neighborhood cast came to perform a concert with the Albuquerque Youth Symphony, in which I occupied a socially awkward seat somewhere in the middle of the cello section. It was so special, he even gave me a signed picture of himself to commemorate the moment. And, while I'm name-dropping, I believe I also met Mr. McFeely and Lady Aberlin. So, you know. It's amazing I'm still so grounded. Lessons for grown up creators? Start by acknowleging the context that you are in. You are living a busy life, in a busy neighborhood of social connections and things to do. This is great! You are part of a whole network of activity and purpose. You are in the hive, held and supported by a neighborhood, a community, a town, a social world. You are still part of that world, even as you move into your more private space of creating. 2. DELIBERATELY NARROW YOUR FOCUS. After this travelling shot through the neighborhood, the camera zooms in on Mr. Rogers' yellow house and then we are suddenly inside the house looking at a close up of the flashing yellow light on the stop light near the fish tank. From the stop light, the camera pans to the door, waiting for Fred to enter. Lessons for grown up creators? As you move into your creative space (your desk, your studio, your workspace) allow your mental camera to zoom in. Begin to constrict your focus from the neighborhood you are in to the particular room or space where you do your creative work. Take a tiny moment to acknowledge a sense of letting go for a time of the bigger world and a movement into the narrower field where you play. The yellow light is the color of transition, right? Neither the go of green nor the stop of red, it is the signal for a change that is underway. It is also a signal that it is time to scoot out of the intersection and commit! The blazer is shed and the cardigan is almost on! 3. CROSS THE THRESHOLD WITH A SPIRIT OF GRATITUDE AND BEGIN YOUR TRANSITION RITUALS. 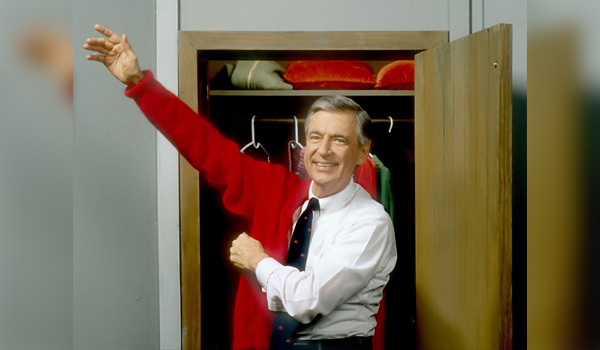 Now that the context has been set and the transition has been signaled, it's time for Mr. Rogers to cross the threshold and join this special interior space. How does he enter? With a smile and a wave and a song. 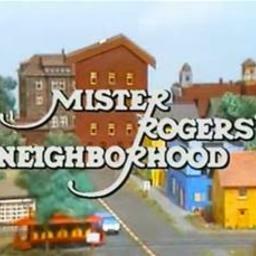 And while he sings, of course, he removes his jacket and hangs it up, puts on his cardigan and zips it up, takes off his "out there" shoes and puts on his sneakers, and then issues a final invitation right to camera - right to each individual kid out there in TV land - "please won't you be my neighbor?" The work shoe is always tossed happily from one hand to the other, because that's fun! Lessons for grown up creators? OMG, so many lessons! First, let's be clear about who you, the creator, are in this scenario. Are you Mr. Rogers entering the space of creating in a cheerful, grateful, and ritualized way? Yes. Or, are you the child who is eagerly waiting for the series of cues that signal to you that a special time to play and learn has begun? ALSO YES! The Mr. Rogers part of you is the part that knows that it needs a process for leaving behind all the obligations and responsibilities associated with the "jacket and work-shoes" world outside. You need a minute to step out of the busyness of the neighborhood, and a way to shed the layers of public persona that communicate your status and role within the social world "out there." And then, you need a process for taking up your less defended, more open and relaxed persona that is ready to be in intimate relationship with your most-beloved. Music helps a lot. And so can a wardrobe change, or even just a set of physical motions that you repeat - some equivalent of the physical steps of hanging up a jacket and zipping up a sweater and tossing a work shoe happily from one hand to the other. And as you are ritually putting on the trappings of your intimate, loving self, you are sending a direct welcoming invitation to that other part of you - your inner creative playmate. "Please won't you be my neighbor?" Maybe this playmate-self is the "creative muse," or maybe it is simply the child-you that still remembers how to occupy the space of imagination and possibility with ease. Perhaps your most open creative mind is always available to you, just waiting for a little loving attention, a set of signals that it is time to come play, and a warmly welcoming invitation to a place where it is welcome just as it is. Do I have a process for crossing the threshold into my creative space? A set of motions or sounds that signal a shift from one state of being to another? Do I enter my space cheerfully, acknowledging my gratitude for the beauty that surrounds me and the gift of this day? Do I have a way of signaling that I am leaving, for a time, the network of social relationships that make up my "neighborhood" in order to focus on the time I share with my sacred beloved creative mind? Do I have a way of signaling to my childlike creative spirit that I am calling her forward to play and learn with me? How do I let her know that she is welcome and safe? Am I willing to loving acceptance to my creative self however she shows up? Can I see through to her intrinsic worth even if her face is a little dirty or she's having a tough day? Join me in two weeks in the beautiful online neighborhood of Zoom! I hope you, my dear neighbor, will join me for my March online workshop - Crossing the Threshold: How to Skip the Inner Battles and Step with Ease into the Space of Creating. We'll be talking together about the kinds of things that keep us from making our own entrances into our creating spaces, and sharing lots of ideas for ways to create transition rituals that make us more available to experiences of creative flow (shoe-changes are a real option!). Choose Tues March 27 or Thursday March 29.